A bag tag is a hard piece of plastic or metal tag with numbers on it. The #1 tag is the best tag. 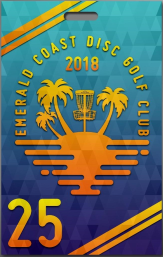 The purpose of a bag tag is to encourage friendly competition among ECDGC members, and to raise funds for the club. 1. Fairness and good sportsmanship shall hold more value than the #1 bagtag. 2. You must have your bagtag with you to play for tags. 3. No handicaps during bagtag rounds. 4. In the case of a tie the tied players decide on how to do the tiebreaker, playoff holes are the preferred method, but players can agree to another method. 5. If a player doesn't participate in the playoff they take the highest bagtag # at stake in the playoff. 6. If you are playing the round and not putting your tag on the line due to leaving early or another valid reason it must be announced prior to the first hole and the player is subject to all form of smack that accompany such an act. 7. If a player fails to finish a bagtag round they get penalized with the highest bagtag # present in the round (except in the event of an emergency). 8. If a player challenges a player with a lower bagtag # to a bagtag round the player being challenged gets to pick the course. 9. Players being challenged have 2 weeks to show up at the chosen course and put their tag on the line. 10. If a player refuses to come out and play for their tag after being challenged, without a valid reason, they will be penalized and required to trade tags with the challenger.